Doing donuts just a few feet away from a crowd is beyond stupid. If you were the proud owner of an ultra-rare LaFerrari Aperta, we wouldn’t blame you for wanting to show it off and hoon around in it – just so long as it’s on a race track. In a staggering display of stupidity, the driver of this white LaFerrari Apera thought the best way to show off his supercar was to perform some crowd-pleasing donuts on the public road during the Gumball 3000 in Budapest. 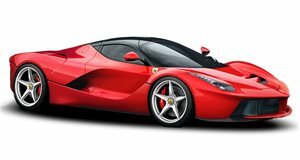 According to the description, behind the wheel was Canadian Ferrari racecar driver Josh Cartu with Dutch DJ Afrojack joining him for the ride in the passenger seat. Watching the hybrid hypercar burning rubber is undeniably a spectacular sight as it engulfs the street with tire smoke. It sounds incredible, too. But the danger of the stunt is abundantly obvious. Not only does he do the donuts on a public street filled with traffic, but the hypercar narrowly misses crowds of onlookers by only a few feet. Still, at least Ferrari can now brag to Porsche that its cars can do donuts, unlike the 911 GT2 RS. A convertible variant of the LaFerrari, the Aperta was built to commemorate Ferrari’s 70th anniversary. Limited to only 209 examples, the hypercar is powered by a 6.3-liter V12 engine and an electric motor generating a combined output of 950-hp. 0-60 mph takes less than three seconds, and it will go on to 124 mph in 7.1 seconds before reaching a top speed of 217 mph. When it was launched, it would set you back $2 million, but we recently spotted a dealer trying to sell one for over $7 million.